The soldier accused of leaking this video is under arrest. It reminds me in an opposite sense of the South African photographer David Goldblatt, who is quoted in a review that I wrote as having said, “the camera is not a machine gun.” He argued for the documentary photographer as a credible, even dispassionate witness, not an overtly militant advocate, even during the years of apartheid. The police in several American states, as in countries throughout the world, evidently now see the person holding the camera quite differently. All this leads into the latest news: The arrest by the military of 22-year-old US intelligence analyst Bradley Manning, accused of having surreptitiously released the widely viewed video of a US attack on Iraqi civilians from a helicopter, resulting in numerous civilian casualties, including two Reuters journalists. Manning’s role was allegedly reported to the FBI by an ex-hacker, Adrian Lamo, in whom the soldier is said to have confided; Lamo himself was previously convicted of having broken into the New York Times computer system. The story is that much more compelling given the confluence of the military, journalists, alternative journalists, and an ex-hacker, all focused on the leaking of a video of killings of real people that seemed to many to have been carried out as if part of a video game. Whether virtual or actual, it all adds up to a sense that as long as media still has an impact on society, then those with any power (military, police, politicians) will try and control its use. For the most part, however, it appears that it is no longer the media professionals who are seen as their primary threat, but the soldiers and bystanders who have access and cellphones. While those in power have learned to largely defuse the Michael Moores, they are still having trouble with the Rodney Kings. This was written by fredritchin. Posted on Monday, June 7, 2010, at 11:09 pm. Filed under Journalism, New Technologies, The World. Tagged Bradley Manning, David Golblatt, Michael Moore, Rodney King, WikiLeaks. Bookmark the permalink. Follow comments here with the RSS feed. Post a comment or leave a trackback. It is quite remarkable how laws prohibiting filming any on-duty officers have passed in three states and this is the first time we’ve jumped. How has it come to this? The US should have learnt from its observations (and sound reporting) of the laws and protests against stop and search powers for UK police under section 44 of the Terrorism Act. Are photographers a real threat? My belief, early, was that Carlos Miller (mentioned in Gawker article) had turned the police-blotter format on its head and gone national in his blog-trawl for incidents of photographer and journalist abuse. Now, however, I wonder if Miller and others like him covering authority/journalist interactions are actually reflecting an increasing problem in the US?. Miller’s website is likely the conduit for a network of concerned folk who freely exchange documents pertaining to strong-arm tactics by police and security employees. It must be said, they are not short of material. Even recognising the fallibility of video, Miller’s efforts to relocate these films/photos/stories of abuse in a single place says a lot for committed blogging, a lot about for organised distribution of content, and most about how the police and security bodies must adapt and relate to new accessible media. One more thing. I think we may treat video/photo as we used to the eye witness. At first, using it as proof of truth, and later analyzing, acknowledging and factoring in its severe limitations. We are all on a continuing visual literacy learning curve but for example, I think courts rooms across nations will want to have, and likely acquire, more visual-savvy juries. I’m not sure I see how legislation against photographers can be illustrated by the case of a soldier (almost certainly) violating security laws by releasing military video footage. It’s really not the same thing at all. I would be surprised if the major media outlets themselves haven’t taken notice and filed suit to strike these laws down on First Amendment and over breadth grounds. If they haven’t, then the first NY Times photojournalist or CNN news crew to be arrested/fined for photographing or filming a police officer in the course of reporting an average news-worthy event (not even one necessarily involving police misconduct) will be a nasty wake-up call. What states, by the way, have enacted these laws? If they be along the gulf, just be careful where you point those cameras while filming and photographing the clean-up. Heck, could you imagine having to report on Katrina without ever showing a police officer in any of your shots? The absurd results of the strict-enforcement of these laws are limitless. 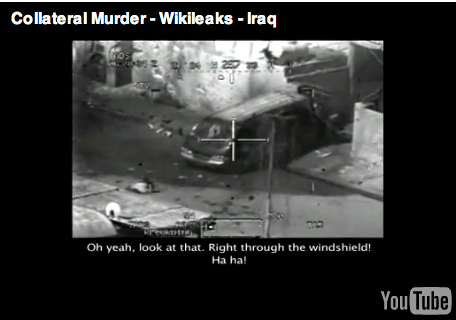 Posting the Wikileaks video to show what many consider excessive violence by the military, or photographing police officers while on duty (perhaps also on occasion appearing to abuse their powers), are linked in that the former is certainly prohibited by law, and the latter is now also prohibited by law in some states. Both issues relate to the conduct of military/police forces and the inability of people to publish imagery that may point to excesses. I watched this video when the story first broke. I was amazed at the lack of compassion by our soldiers firing the weapons…the joy the expressed after confirming “kills”, etc. Now I’m not saying that we don’t need to support our troops in the legitimate war against those who would harm us. But maybe we need to consider a slight re-education of our soldiers to make them understand that war, in every form, is evil. Do what you have to do, but take no joy in it. And when that joy is expressed, and it later turns out to be civilians who were slaughtered, it’s just…shameful. We need better intelligence. We need better eyes on the ground. We need more confirmation before we shoot up a van full of civilians and children. That said, we also need to educate the the civilians in the war zone to not put themselves and their children in harm’s way. This video, in it’s entirety, is disturbing.